Richelle G. Marasigan, DO is a board-certified family medicine doctor who has six years of experience. 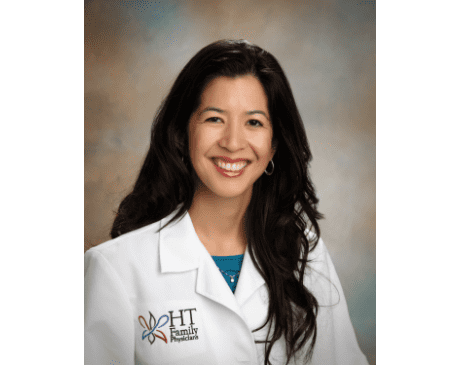 She provides a full range of primary care services to patients from the greater San Joaquin area at HT Family Physicians, a long-serving family practice with two locations in the cities of Stockton and Lodi, California. Dr. Marasigan understands that overall health depends on a combination of factors, and believes that patients who nurture the various aspects of their well-being are more likely to lead long, healthy lives. She strives to offer patients the support, expertise, and guidance they need to take an active role in their own health care. Dr. Marasigan was born and raised in Stockton and obtained her undergraduate degree from Emory University in Atlanta. For all of her four years at Emory, she played on the women’s tennis team, leading the team to three Division III NCAA National Championships. After receiving her medical degree from the College of Osteopathic Medicine-Touro University of Nevada in Henderson, Nevada, Dr. Marasigan returned to California to complete her internship and residency training at the University of California Irvine Regional Hospital and Medical Center. During her residency, she served as chief resident of the Family Medicine Program. Dr. Marasigan is currently affiliated with Dameron Hospital and St. Joseph’s Medical Center of Stockton. In addition to spending as much time as possible with her young son, Dr. Marasigan continues to play tennis, enjoys jazzercise, and travels whenever she can.